It is the season of festivity and party with an open heart since the air of Christmas is blowing already and the weather of warmth has just begun, we get to surprise our loved ones by throwing surprise parties and BBQ get together settings. All this and more includes in the schedule of Christmas and the happenings are reserved for the month of December. Even before the day arrives, people arrange mighty and grand parties for their loves ones. There is much mobility and hassle being observed at the end of the year, people make their traveling ventures possible just to be there where their family lives. You can always send greeting cards to far off people whom you cannot pay a frequent visit however if you get something party-like in your mind then for sure my post will help you a great deal to finalize a party flyer for yourself. 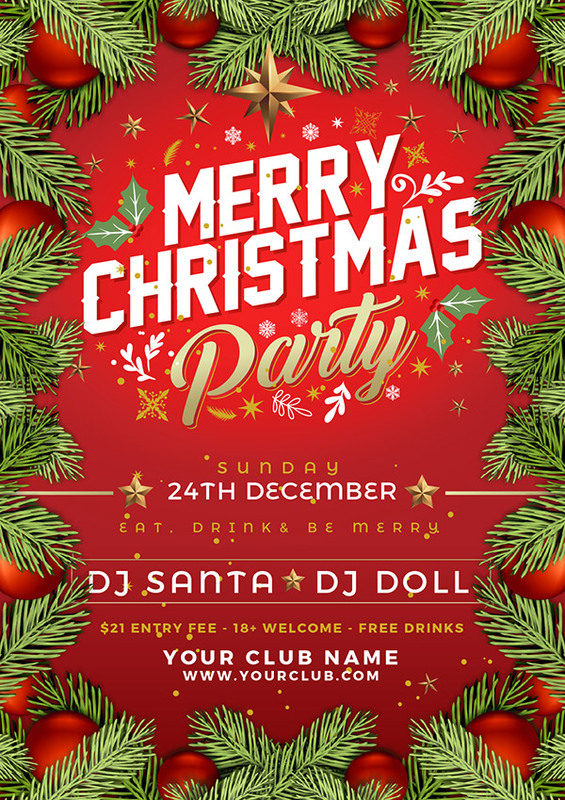 Down here I am putting forward free Christmas party flyer / poster design template of 2017 that can be used by designers for the sake of Christmas party gatherings. Either it be indoor or outdoor, at home or at a farmhouse you can always use flyers to reach people so they in return may reach at you. Also if you get to arrange a little eat and greet session, a concert or any musical night then a party poster is the right match to get to your guests/friends. The flyer can depict day/time, setting/venue, availability of tickets, activities and all related stuff. 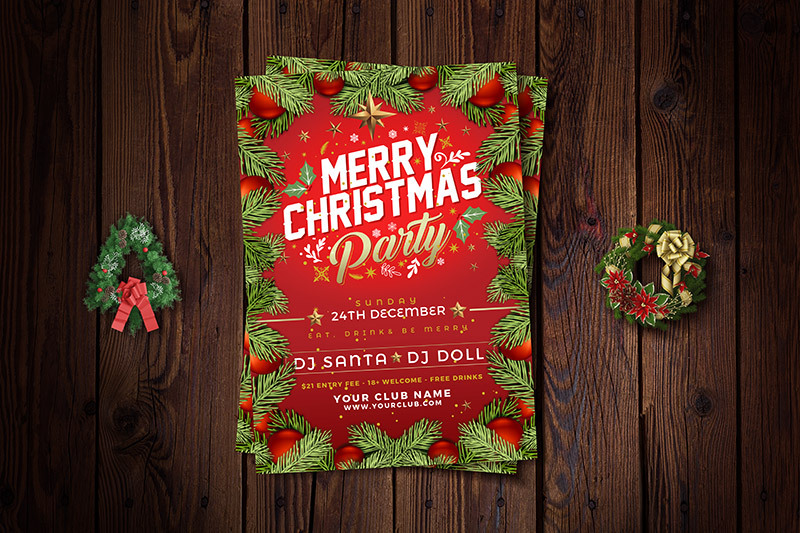 So make sure if you, being a designer, have been looking up for a Christmas party poster then this template will inspire you and aware you how red color can be played for the tinge of Christmas. Also give importance to the requirements of the client that how he wants his party poster to be. Just be clear about details, make it creative and super welcoming. For more Christmas party happenings, trends and designs, don’t forget to subscribe to us to get daily design updates and tech prompts. Here we go with a bang. Let us, till then sing, jingle bells, jingle bells, jingle all the way.